Control and measure your Critical Communication training for better real-life results. 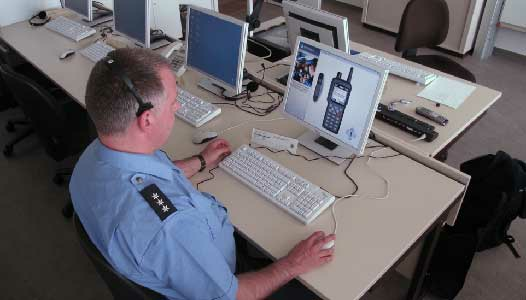 Read the Critical Communications Review article on why and how ASTRID and the Police work together to provide training using the Beaconsim products in Belgium. 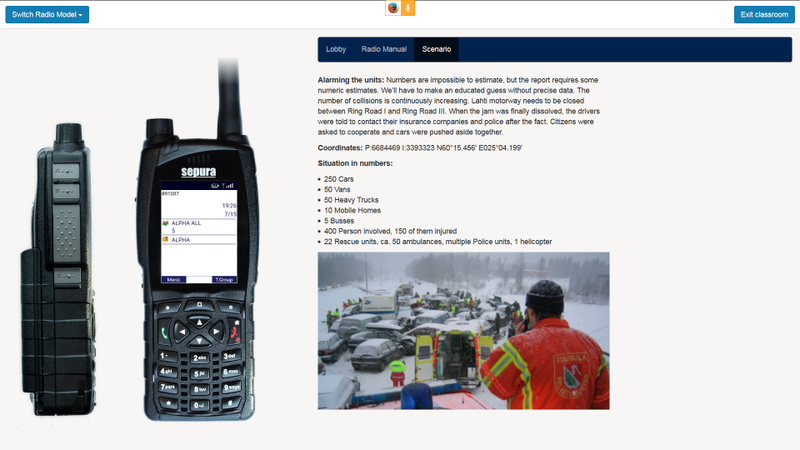 Beaconsim is a full fledged solution for Critical Communication (TETRA, LTE, 5G, DMR, digital PMR, Tetrapol, Mesh or proprietary networks) training and planning. Our advanced radio and C&C dispatcher simulators allows you to measure and control your trainings for better real-life results. Our solutions range from a virtual classrooms of few students to self-learning of thousands. We have customers in 28 countries in Europe, Africa, Middle East and Asia. Simulator exercises and direct feedback teach the correct procedures and operations in real-life situations. 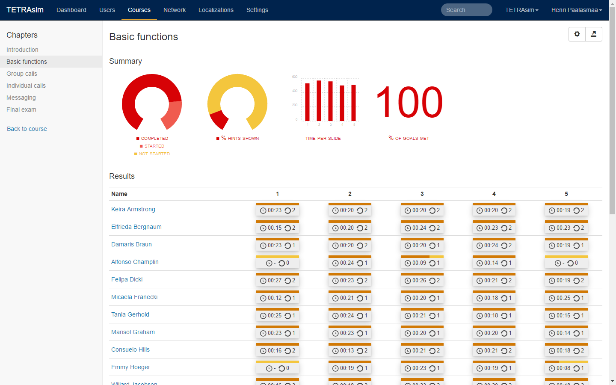 See an overview of your organization’s current skill level and the areas of improvement. Remote-based means that you’ll save both time and money. Training becomes interactive and fun. Students are more motivated and happier. Follow the skill development on the organizational, departmental and individual level. The content is not dependent on a single trainer. All students have access to the same high-quality content. Once the training content has been made, thousands of students can be trained without any additional effort. Integration to an existing LMS or SSO such as Moodle or Windows AD are available. Possibility for a turnkey solution where everything, including hosting, is taken care for you. Students can create their own user accounts. Run all levels of trainings, from simple button exercises to advanced SOP-based communication trainings from single platform. 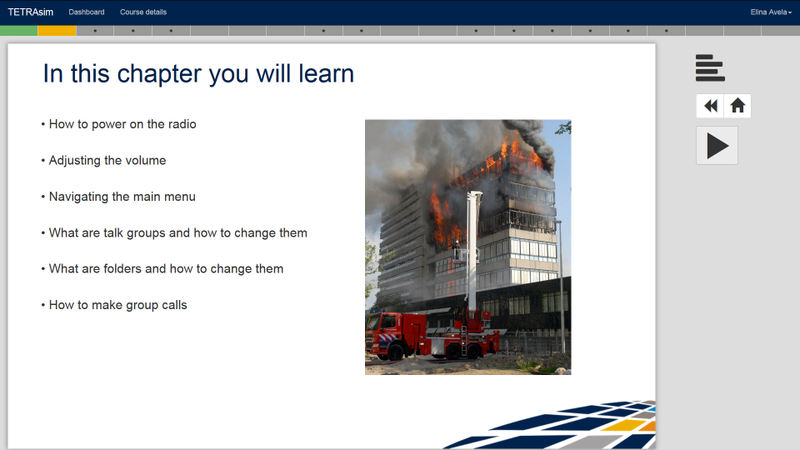 The simulator is 1:1 copy of your organization’s radio with real radio parameters. Add picture sequences, video, audio trainer stories and magnet boards to bring the training closer to real-life situations. 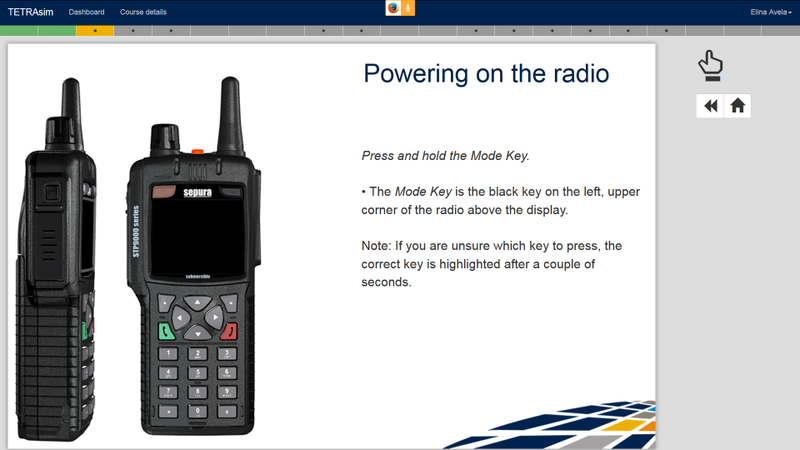 Course content available for all radio models and any language. Easy to use graphical editor to keep the training content up to date or to create your own content. Everyone learns differently – take your time and rehearse when ever you need. Access the training from your work laptop, home desktop or using a tablet. After successfully completing a training and taking a final exam you’ll receive a certificate to hang on your wall. Learn hard-to-teach features such as making Emergency Calls and Queueing in a safe, low-stress environment. Instant continuous feedback gives you measurable results in short time. Simulator training is reality-based, measurable and easily controlled by the trainer. 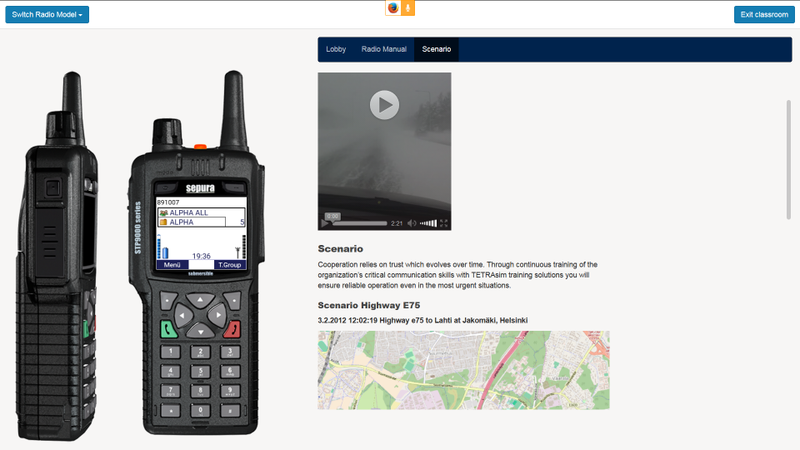 ONE is a self-learning system for radio users with interactive radio simulators and it enables fast training of large organizations. Learning targets can be defined and results measured. 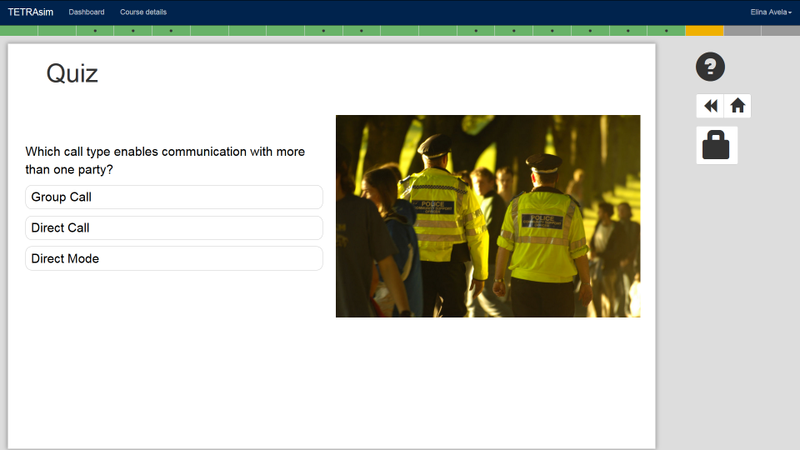 Text, pictures, video and audio are accompanied by simulator demos and exercises with which users learn at their own pace whenever they have time. 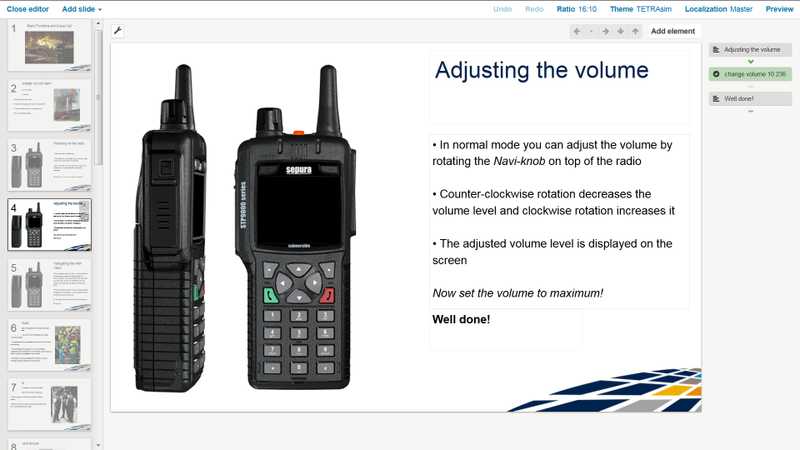 Simulators can be adjusted to have the likeness of real radios, with the right talk groups, folders and other settings. Users receive feedback on their learning and get a certificate after they have reached the required level. If simulator tests are repeated for example annually they can be used as a prerequisite for a user license or for attending a simulator drill. ONE is installed at a server and its courses are used from any PC, laptop or tablet and it does not require any special program installations – browser suffices. 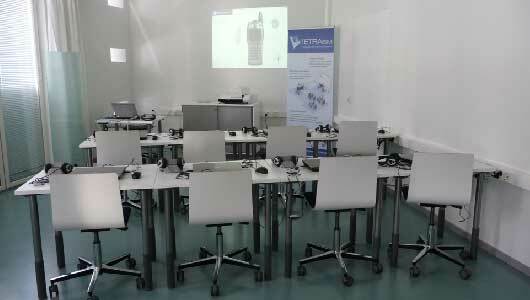 TETRAsim ONE is a self-learning system for radio users with interactive radio simulators and it enables fast training of large organizations. Learning targets can be defined and results measured. 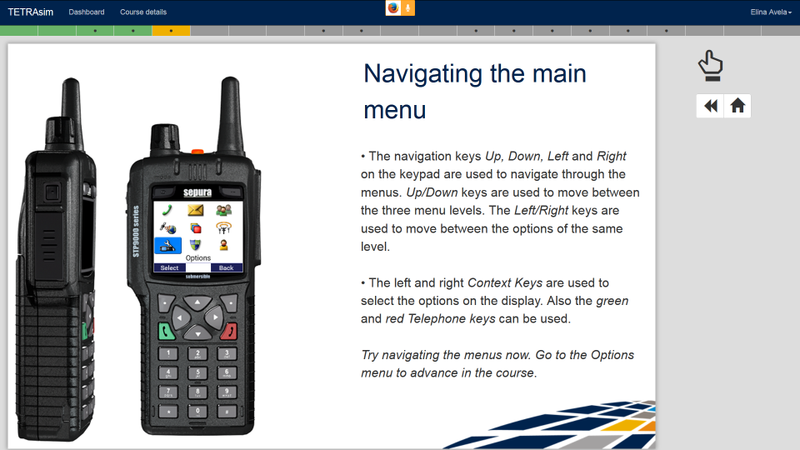 Text, pictures, video and audio are accompanied by simulator demos and exercises with which users learn at their own pace whenever they have time. 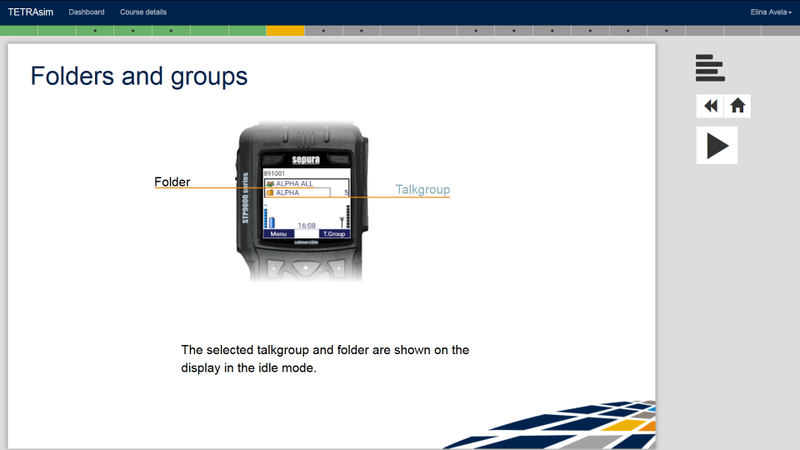 Simulators can be adjusted to have the likeness of real radios, with the right talk groups, folders and other settings. 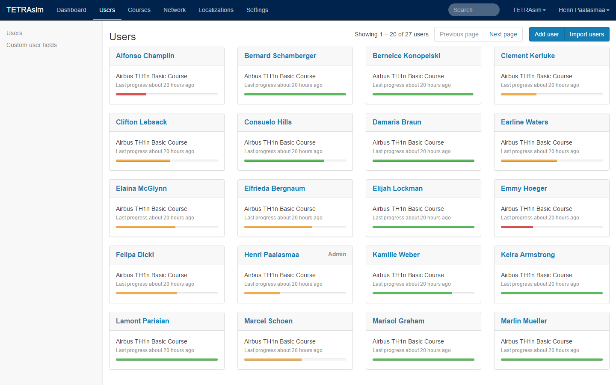 Users receive feedback on their learning and get a certificate after they have reached the required level. If simulator tests are repeated for example annually they can be used as a prerequisite for a user license or for attending a simulator drill. TETRAsim ONE is installed at a server and its courses are used from any PC, laptop or tablet and it does not require any special program installations – browser suffices. TEAM is a virtual classroom including a virtual radio network with its radio terminals, dispatchers, C&C, field command and data applications. It’s a simulated radio network that has the real network’s functionality, fleet maps, talk groups, folders and other parameters. TEAM ensures learning in an environment which is realistic without the risk of doing something wrong or using resources which are needed elsewhere. 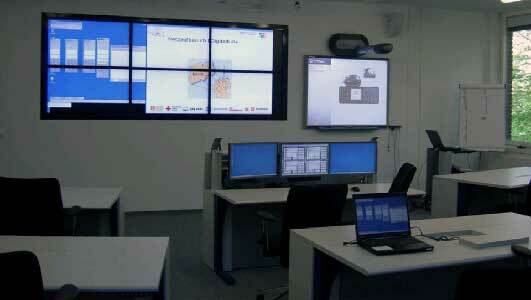 Virtual classroom enables trainer-led training even remotely – without travelling. 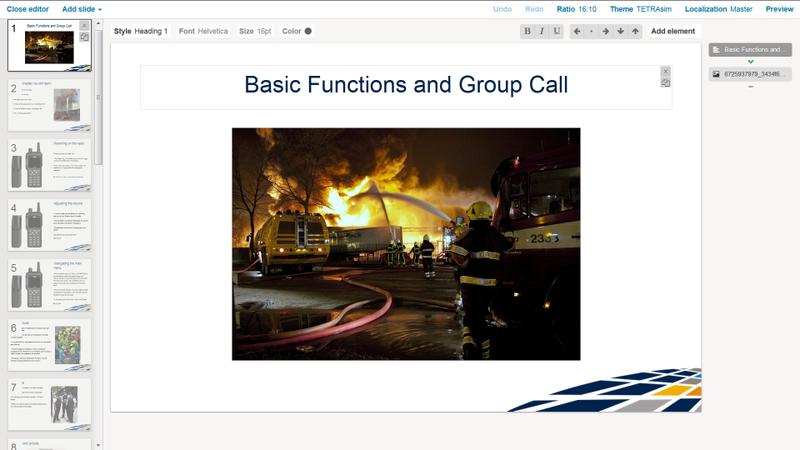 It features group exercises and scenarios with group dynamics which self-learning exercises lack. During exercises the trainer is in control and can follow each individual’s progress: focus is on learning instead of training. Students’ activities can be recorded: speech items, key pressings and their timings. These form an objective base for the de-briefing session after the scenario. 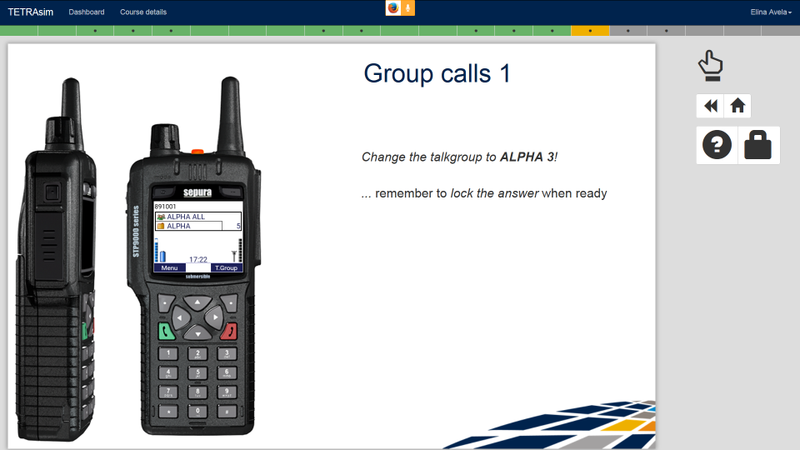 TETRAsim TEAM is a virtual classroom including a virtual radio network with its radio terminals, dispatchers, C&C, field command and data applications. 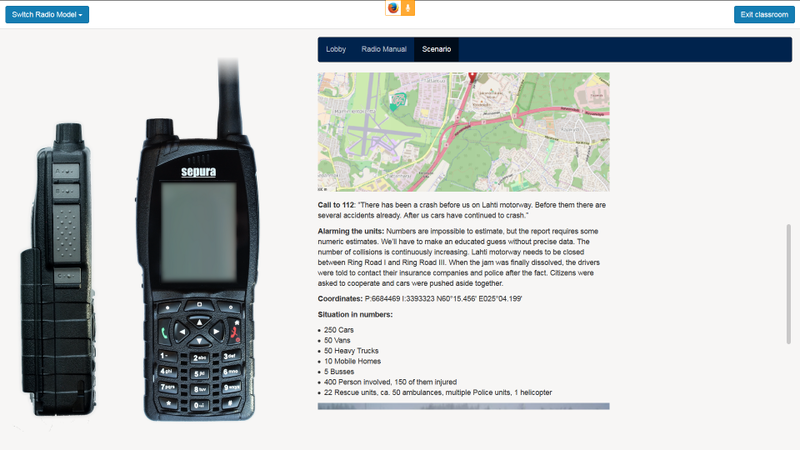 Its simulated radio network has the real network’s functionality, fleet maps, talk groups, folders and other parameters. TETRAsim TEAM ensures learning in an environment which is realistic without the risk of doing something wrong or using resources which are needed elsewhere. PLAN provides a virtual communication environment where different fleet maps, operating procedures terminal parameters and network settings can be tried out in a safe, simulated environment. In order to have a successful roll-out planning and defining those should start already long before the real network or new services are up and running. This saves time and supports the change management process as the functions and services of the new radio network can be introduced to all user organizations in a timely manner without time consuming re-iterating phases. Engaging end users right from the start of the project is essential for the success, acceptance and efficient usage of the network. TETRAsim PLAN is a virtual radio network which can be parameterized in several ways with various fleet maps, talk groups, folders and other radio and system parameters. It is disconnected from the real network and thus cannot disturb it in any way. 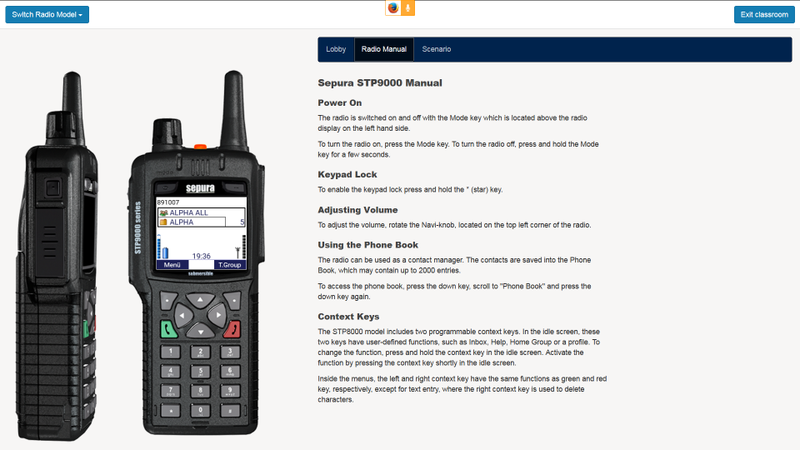 It can be used for planning of parameters, testing the effects to radio users or dispatchers. It is possible to create several virtual networks which can be shown as a demo to user organizations and using them as a basis for decision making before making the final changes in the real network. TETRAsim PLAN’s virtual network can be also used for planning of communication plans and SOP’s and testing them. When using it as a tool in change processes it shortens acceptance at user organizations and also reduces expensive iterations in the real network. LAB is a flexible radio network test bed for own development and testing purpose. 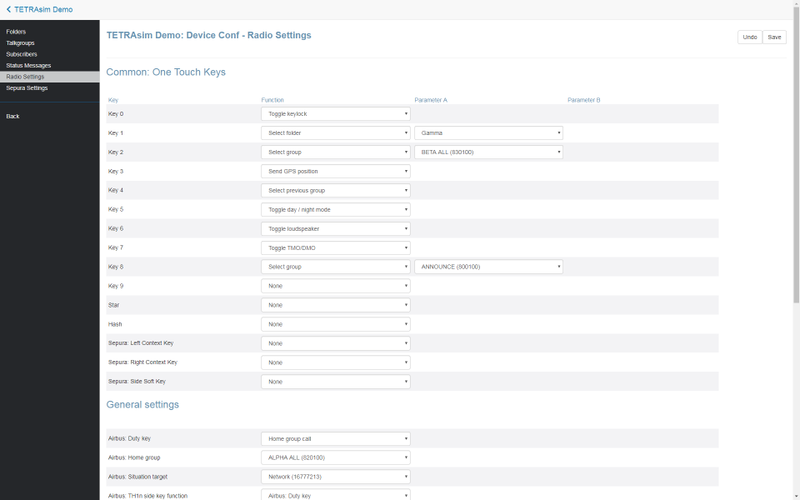 The simulator offers various API and PEI interfaces which can be selected to match the development needs. The simulated interfaces have exactly the same functionality as the real interfaces. By that, LAB provides independency of network manufacturers’ testbeds and gives flexibility for lab testing and customer trials. Thus, simulator testing reduces travelling times and costs as well as expensive testing fee expenditure. TETRAsim LAB is a flexible virtual testbed for all applications, functions and services of the network. It is an alternative for manufacturers’ testbeds especially at the beginning of the development and it reduces the time needed for development and testing and cost for travelling. The system has features which support development and testing work: multiple virtual network/radio settings, load testing, different API and PEI simulator versions for integration. English Radio discipline, Critical Communications Today "Hope for the best, train for the worst" in the Critical Communications Today Magazine, September 2018. Dutch TETRAsim article in SWITCH magazine TETRAsim article in the ASTRID’s SWITCH Magazine, issue 34. Dutch edition. French TETRAsim article in SWITCH magazine TETRAsim article in the ASTRID’s SWITCH Magazine, issue 34. French edition. English Airbus product description Airbus product descriptions in English, 4 pages. English Motorola product description Motorola product descriptions in English, 4 pages. English Sepura product description Sepura product descriptions in English, 4 pages. German Airbus product description Airbus product descriptions in German, 4 pages. German Motorola product description Motorola product descriptions in German, 4 pages. German Sepura product description Sepura product descriptions in German, 4 pages. Finnish Airbus product description Beaconsim Airbus product descriptions in Finnish, 4 pages.